The PV14 is a cost effective shunting regulator designed for smaller 6V, 12V, or 24V Solar Only applications with a maximum solar charging current of 14A. 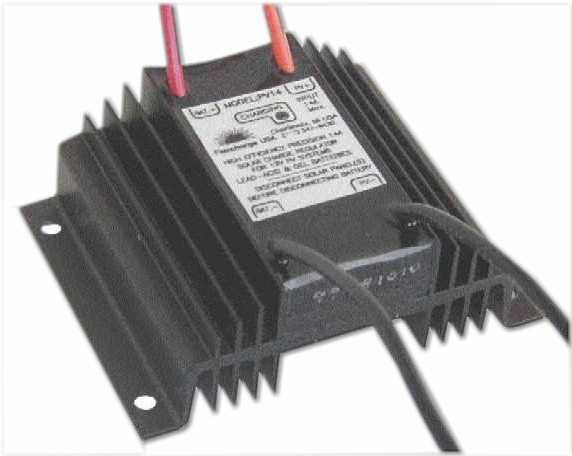 Special order 6V or 24V units. The PV14 controller is easily expandable to handle charging currents up to 500A. We engineered this controller to be extremely efficient, accurate, and small (3" x 4.75"). It is Ideal for use in a marine environment. Use with Lead Acid or Gel battery technologies. Like the NC25A it also uses only 4mA to operate its circuitry. This controller is not for use with outboard motors. 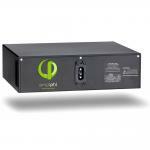 The PV14 is an all solid state design using the highest efficiency components. All shunting type regulators must use a blocking diode in the charging path to block the battery voltage when the controller is regulating. The heat sink on the PV14 is used to dissipate the heat generated by the high efficiency blocking diode in the PV14. We took great care to design the PV14 for long term operation in unattended locations; extensive transient voltage protection; high steady state voltage protection (it is not affected by continuous charging input voltages up to 50V, the point where the transient voltage protection activates); fully sealed electronics for 100% humidity operation; etc... The PV14 is designed for Install and Forget operation. The PV14 includes an easy to read Charge Indicator. The peak charge voltage is factory set so there are no user adjustments to contend with. System wire connections are made by connecting to the controllers wire pigtails either by soldering or via a terminal strip. Upgrading the controller to regulate form 30 up to 500 amperes can be accomplished easily and is relatively inexpensive. Contact Flexcharge for details. This is the charging process used by all Flexcharge controllers. It has many benefits including greatly reduced gassing during charging and it allows for micro equalization of Lead acid as well as Gel battery technologies. Click on the link for more details. 100% Waterproof electronics for mounting in a marine environment. Uses Super High Efficiency Solid State Surface Mount Components. Oversize heat sink to keep the internal components cool . Machine assembled in the USA to ISO 9000 standards. Internal Precision Voltage Reference for high accuracy voltage regulation. 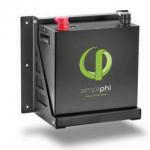 14 amp charging capacity for small to intermediate size solar arrays. Expandable to handle up to 100A of charging current, and multiple charging sources. Up to 60 to 1000A Charge Divert option. Consumes less than 5mA while charging and only 2.6mA at night. Built in Isolation prevents nighttime back flow of electricity from your batteries to the solar panel(s). Uses Energy State Taper charge algorithm for fast battery charging and super low battery electrolyte depletion. Looks for the full charged resting voltage of the battery to protect against overcharging. Charges a Zero Volt battery with full charge current. Many of the features, which are standard on the PV14 controller, are considered options by other manufacturers. Features like transient surge protection, or the charge indicator. CASE SIZE H=1.2" W=4.75" L=3.0"